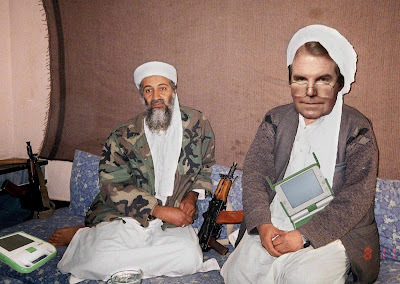 The Secret Diary of Steve Jobs : Negroponte: "We have been more like a terrorist group." Negroponte: "We have been more like a terrorist group." That’s a real quote from Nicholas Negroponte from a video interview he did at CES. See the BBC article about it here. And see the original video here. Seriously, who does this guy’s PR? Do they actually write this stuff for him? If not, do they at least check it out before he says it? I sort of imagine them all sitting there cringing every time he starts to speak. Full quote is this: “2008, for us, is a big change because up to now we have been more like a terrorist group, threatening to do something and making big claims. 2008 is where we become not a revolution but a civilisation [sic, it’s the BBC, ed.] and we actually roll out laptops within countries.” Stick with the video a while and you’ll get another howler — now he says that OLPC did not throw Intel out and did not want Intel to leave. Even though, just a couple weeks ago, he went around saying that that was exactly what happened, and that Intel had been on “probation” with OLPC and, like a strict headmaster that he seems to think he is, Saint Nicholas had been given no choice but to expel that troublemaker Intel. Oh, and now Double-N says OLPC would love to see many different laptops made for kids, including the Intel Classmate, and that OLPC never insisted that Intel stop promoting the Classmate. You straight on that? It never happened. And if you say it did, you’re against the kids. And against freedom. Or something. For the record, Intel does not “make” the Classmate. Intel publishes a reference spec, and hardware OEMs in various countries use that spec to build a machine for schools in their country. Which, oddly enough, creates jobs for the parents of the kids who will use the machines. What a wacky idea, right? Photo above shows Negroponte and Richard M. Stallman discussing their plans to destroy Microsoft and Intel.